On the 28 April 1944, a party of 60 Japanese soldiers led by Corporal Hamada Kazumi raided a village at Kuala Kubu Lama, Selangor state. The raiding party had fired a shot into the air when they arrived, causing the villagers to run helter skelter. The remaining villagers were rounded up, and a house to house search ensued, following which poultry and blankets were taken. Seven men, comprising the above named victims and LEI KOW, were made to kneel down in a row with their hands tied behind their back. According to LEI KOW, they were not questioned by the Japanese during this time. The seven men were herded into a house belonging to Lim Loo Choon. Corporal Hamada, along with seven or eight subordinates, bayoneted the men inside the house before setting it alight. Several shots were also fired into the burning house. LEI KOW was bayonetted but managed to untie himself. He testified that he saw KOW CHEN run out the front door. LEI KOW escaped through the back of the house without being observed by the Japanese. LEI KOW was asked to show the court the place where he was bayoneted. The court transcript indicates that "witness exhibited one spot on the left chest and two on the back." LEI KOW testified that he returned to the scene two hours later where he saw the charred bodies of his neighbours and the body of Kow Chen lying outside. Witness Lee Fut Siew claimed that he was hiding in a bush about 40 yards away from the house that was set alight. He testified to seeing the villagers being rounded up, watching the seven men being led to Loo Choon's house, and of observing Hamada (who had a pistol and a sword on him) borrowing a bayonet from another soldier's rifle before he stepped into Lim Loo Choon's house. He could not testify to witnessing the bayoneting with his own eyes but claimed he heard screams coming from the house. He testified that he saw a bloodied LEI KOW leave from the back of the house, and of witnessing KOW CHEN running out of the burning house. He testified that KOW CHEN got as far as a nearby bridge before being shot by Hamada, who was about eight yards away, with a pistol. After this, the raiding party left the village. Several hours later, along with about ten other neighbours, Lee Fut Siew went to Lim Loo Choon's house and saw the charred remains. When asked to describe if he could recognise the victims, Lee Fut Siew stated, "Burnt beyond recognition. Some were lying on their faces, some on their sides." KOW CHEN's body was found next to a tree, near the bridge. When asked what they did with the bodies, he replied, "We did nothing that same day. We were afraid and returned next day at four p.m. We got all six bodies buried." On 25 September 1945, LEI KOW, Lee Fut Siew and another unnamed villager, identified Hamada from about 150 to 200 Japanese civilians and soldiers present at an identification parade. According to RAF Squadron Leader Charles Edward Jackson, who was also the District Officer of Kuala Kubu Bahru, he had been present, along with the Major Husha Singh (Rajputana Rifles) and another police officer. They had escorted the three witnesses to the parade grounds, where the "Japanese personnel" were lined up in columns of five. Jackson testified that when they got to the third row, the three witnesses "made a concerted effort towards one Japanese [Hamada]" and "I thought at the moment they were going to assault the Japanese." The defence criticised the identification parade as being "irregular" and a "wash out" as all three witnesses were "walked up together" and suggested that LEI KOW could have influenced the other two. District Officer Jackson, in his reply, stated: "I am not competent to answer that, but I do know recognition of the accused was mutual. They all made a rush." When cross-examining LEI KOW, the defending officer suggested that LEI KOW was known to Hamada as Shu Tai, and that in July 1945, Hamada had arrested him and interrogated him to reveal the whereabouts of nearby Communist activities. According to Hamada, Shu Tai had given up the location as Pratak. The defence argued that because of ill-treatment by Hamada in July 1945, LEI KOW had an axe to grind with Hamada. LEI KOW however denied that he had ever gone by the name of Su Tai or that he had been arrested by Hamada in July 1945. When accused that he had been "in league with the notorious Chinese bandit Communist Party," LEI KOW replied, "No, not so. I devoted all my time to planting food crops; I have a lot of children." The defence then challenged LEI KOW again: "Finally, I put it to you, to pay off your old scores you found a splendid opportunity on the twenty-fifth of September to point your finger at this accused as the person who perpetrated this alleged war crime." LEI KOW replied: "There is no reason why I should point to him. There were a lot of people I could have pointed to." When cross-examining Lee Fut Siew, the defending officer suggested that LEI KOW had identified Hamada first during the identification parade. Lee Fut Siew denied that this was so, claiming that he was only "a bit behind" LEI KOW and that "before his shoulder was touched [by LEI KOW], I recognised him." The defence also tried to make out that Hamada was known locally as a "notorious chap" for ill-treating civilians and that Lee Fut Siew was aware of his bad reputation. Following this line of defence, the defending officer asked Lee Fut Siew: "What grounds have you personally to hold a bad opinion about this prisoner Hamada -- personally." Lee Fut Siew replied: "He burnt down my house. Food and clothing were destroyed." When asked when this incident had occurred, Lee Fut Siew indicated that his house was burnt down on the same day that the mass killing had taken place, that is, 28 April 1944. The defence was unable to show that Lee Fut Siew had been ill-treated by Hamada on another occasion. Hamada, in his defence, denied recognising any of the victims or their names (including LEI KOW's). He stated that in September 1944, he was in another state, Johor, and did not know why this case had been brought against him. He testified that during the identification parade, he had been identified by Shu Tai and not LEI KOW, even providing a different description of the man. Further, Hamada denied he had arrested seven civilians, made them kneel down, escorted them to a house or bayoneted them. And to his recollection, he only remembered burning a house or houses in a place called "Lama" in the month of May 1944 but not April 1944. 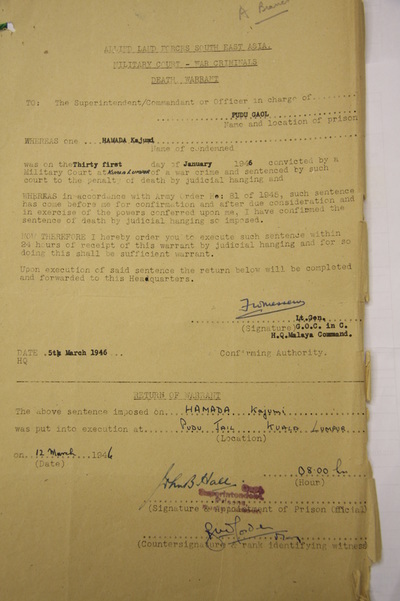 When asked what his function was in the month of April 1944, Hamada testified that his function was "to collect information about Communists in Kuala Kubu." However, when asked if he was attached to the Kempeitai or military police, Hamada confirmed that he was attached to an army garrison, Ajiro Company. 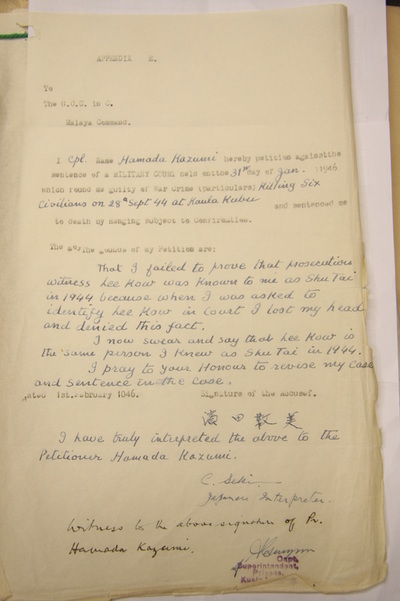 During cross-examination of defence witness Captain Ajiro Masanori (Hamada's commanding officer), Ajiro confirmed that Hamada was attached to his Fourth Company and that in April 1944, "Hamada was Lance-Corporal and as one of the privates (O.Rs) had no special function." However, when asked if Hamada was tasked with investigating evidence of Communist activity in Kuala Kubu, Ajiro stated: "He had no functions to collect information about Communist activity in Kuala Kubu." There was confusion in court as to the names of the victims, no doubt due to different transliterations by the court clerks and those involved in preparing the original charge sheet. 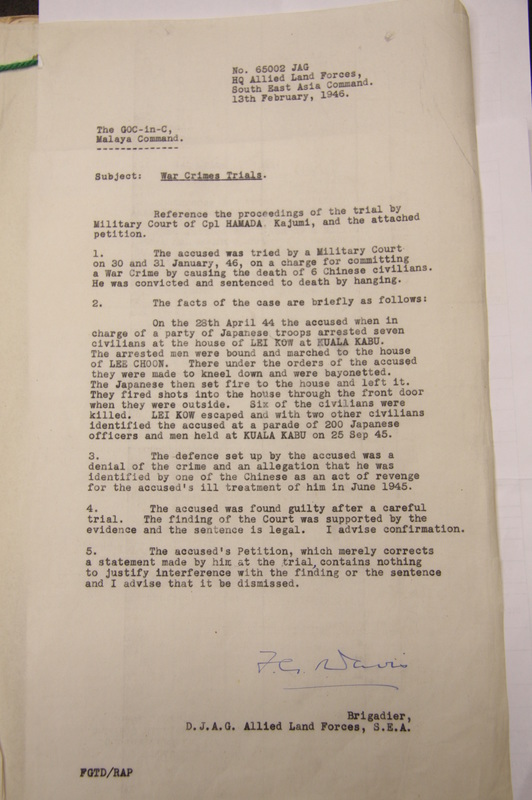 The charge sheet only identifies six of those who were killed during the incident; charges were not brought for assault on behalf of Lei Kow (Lai Ku) who served as witness for the defence and sustained injuries during the commission of the crime. Hamada and Ajiro's testimonies were contradictory, and in some ways only confuses matters. Why was Hamada, according to his claim, involved in investigating Communist activities when such functions usually fall to the Kempei or military police? Was Ajiro telling the truth, i.e. that Hamada had not been tasked with investigating Communist activity? If Ajiro was truthful, why did Hamada lie; was he trying to justify his actions? (In the defence's closing plea, the defending officer argued that Hamada had been "assigned the onerous and risky job of tracking down Chinese Communists, a job which in a few cases demanded and perhaps justified terror methods against citizens to desist them from harbouring these Chinese Communists.") Conversely, if Hamada was being truthful, why did Ajiro lie; was he attempting to fend off possible prosecution upon himself as Hamada's superior? Neither the prosecution or the defence raised the question as to whether Hamada had received a direct order from Ajiro to conduct the raid. Further, who were the others involved in the raiding party and why were they not prosecuted as well? In Hamada's petition against his sentence, he referred to the incident as having occurred on the 28 September 1944 (crime was alleged to have occurred on 28 April 1944), and claimed that "in court I lost my head and denied this fact [that LEI KOW was known to him as Shu Tai]" and that he actually knew LEI KOW as Shu Tai in 1944. Was this petition from a innocent man clutching at straws or a guilty man too caught up in the twists of his own lies? E.g. Why was the incident upon which Hamada was charged incorrectly dated; was this just an honest mistake or was Hamada truly confused as to whether the case under deliberation related to events in April or September 1944? Why did Hamada now claim to know LEI KOW as Shu Tai whereas in court previously he claimed to not recognise or know LEI KOW? During the trial proceedings, the defence had argued that LEI KOW was Shu Tai, and that Hamada and Shu Tai had history because of Shu Tai's arrest and ill-treatment by Hamada in July 1945. If this is true and not just a defence strategy, why did Hamada now claim to know LEI KOW from 1944, as opposed to 1945? Further, there was no corroborating evidence from witness Lee Fut Siew that Hamada had recognised or addressed LEI KOW/Shu Tai during the raid of 28 April 1944.